In this challenge, I'd like to see some cards that send cards to exile face down! Limit of 3 entries max per person. *Top 3 winning card will get a favorite from -TROPHY-; and a spot on -HALL OF FAME- ! Can I post an old card @Tomigon? 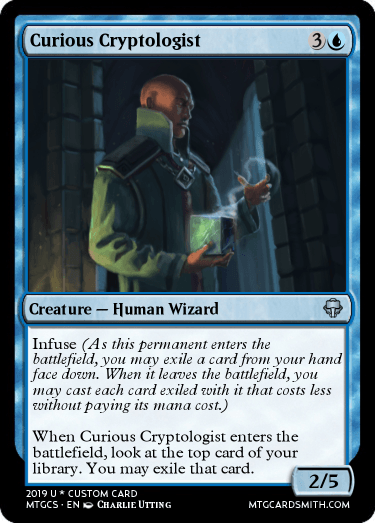 The rules say "Only new cards," but @Tomigon might let it slide since it is such a recent publication. What a coincidence! Ok, I'll accept that card! Those are very cool cards, but your Rooting Riverside doesn't count because it exiles the card face up. Sorry! That's a very interesting card! 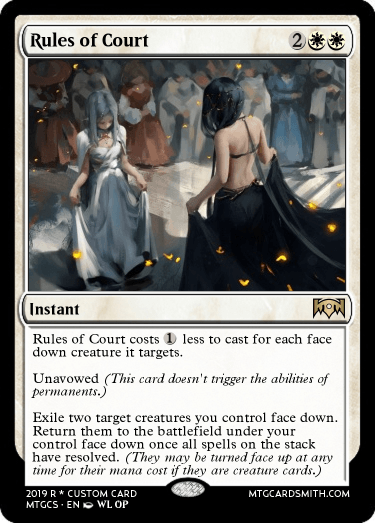 But there are two problems..
1) WotC would make it say "as a 2/2 creature" after "Return them to the battlefield under your control face down". 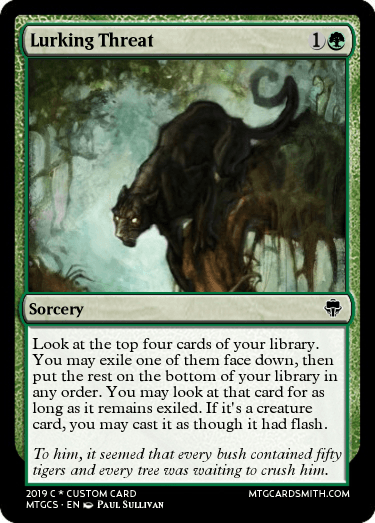 But if you say face down permanents are always 2/2 creatures, then it's fine. 2)Opponents can know which concealed creatures are which, because they can see your movement and remember which face down cards are which. Check out example cards I provided in my first comment. They say "exile them in a face-down pile, shuffle that pile ..." Maybe that's what you want to do. 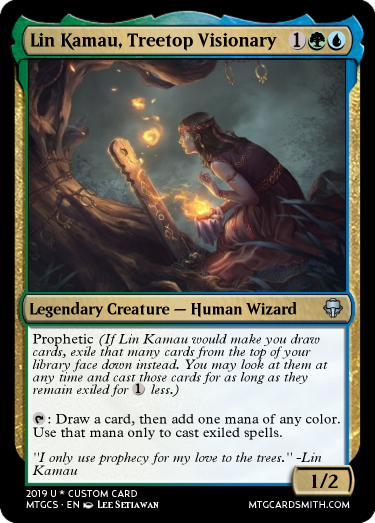 Rules text from Wizards says that any face down permanents are automatically 2/2 creatures, which is why I didn't specify there. To cache a card means to exile it face-down as cached. Players may look at any cached cards they own at any time. 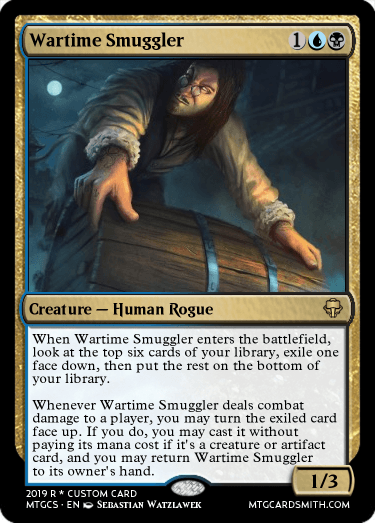 If a player would draw a card and they own any cached cards in the exile zone, they may instead choose one of those cards and draw that card instead of drawing from the top of their library. Here's a related walker among other things. Pulled this card from the contest. 1) No matter how many cards you cached, if you don't shuffle them, opponents can take notes and remember which face-down cards are what. 2) You can add cards you don't own to your hand. 3) "draw from your cache" sounds weird, and it needs related rules text that doesn't fit in cards. So I made my version of cache. 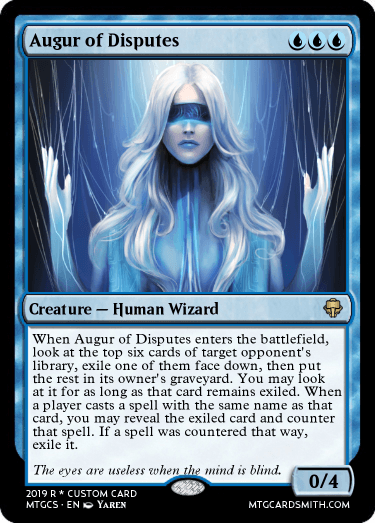 I know giving abilities to exiled face-down cards are weird, but cards like Delay give an ability(suspend) to exiled card, so I think it works. But that card doesn't interact with the exiled cards.. Then why the exiled cards need to be face-down? @Tomigon they are face down to count in your contest. Is there a rule they have to do something to be exiled face down and not face up that I missed or something? I edited it. Nevermind. I'm pulling this card from the contest. 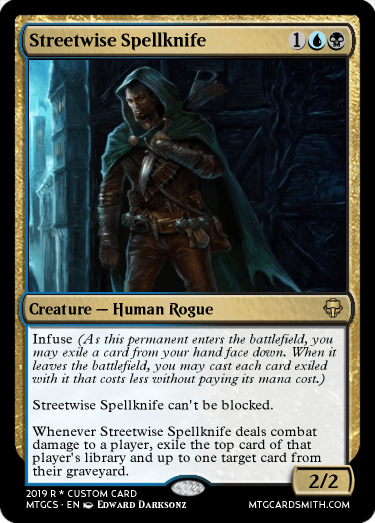 Yeah, that card didn't break any rules, but it just didn't have the point of exiling cards face down: Face-down cards should be like your 2nd hand/library(1st example card), smoke bomb that confuses your opponents(2nd example card), or some kind of secret weapons(3rd example card). You don't cast the copy? 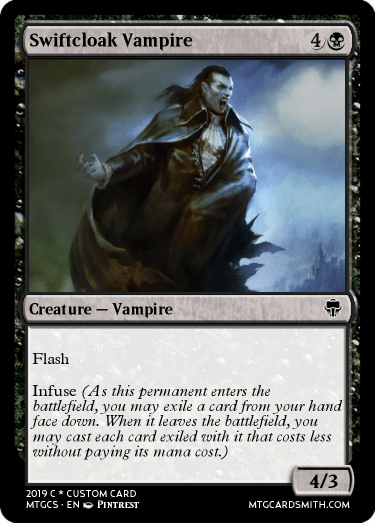 Cards like Doublecast or abilities like Storm don't say "cast the copy", because their original spell were already cast. @ningyounk and I are reworking the Cache mechanic. Wording and function along with a reminder token card are in the works. I don’t think you’d ever be able to add cards you don’t own to your hand? Maybe I’ll have to check back with you on that eventually. 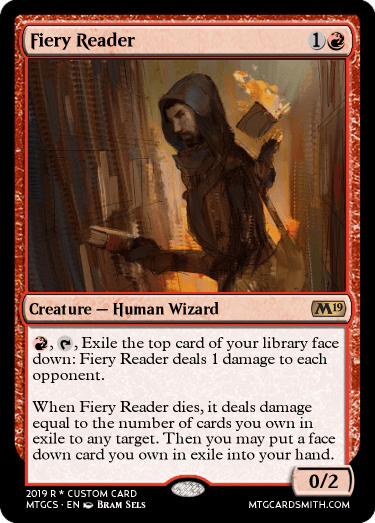 He burns through a lot of books, but eventually finds what he's looking for.